The C55 Sled Base Patio Strap Chair is as versatile as it is durable. 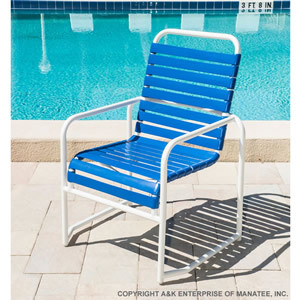 The sled-base design of the extruded aluminum frame makes this patio chair suitable for use on hard surfaces and sand, alike! The box-style frame provides extra support behind the backrest of the chair and an under-seat brace provides additional structural support. The C55 Sled Base Patio Strap Chair stacks easily, has 2 inch double-wrapped vinyl straps, and may be powder-coated and strapped in any color combination from our color chart.